For the past 4 months now I’ve been doing the digital nomad thing, working as a programmer and traveling trough Europe in a campervan. Which is awesome, especially the non working things are great. I work for the same company for over 2 years now. It’s actually more just a bunch of nerds building pretty things for the interwebs. We all basically work fulltime from home, every week or so we get together somewhere and work from there. It’s nice not to work in pyjamas sometimes. After working like this for over a year I had kinda seen enough of the inside of my house. 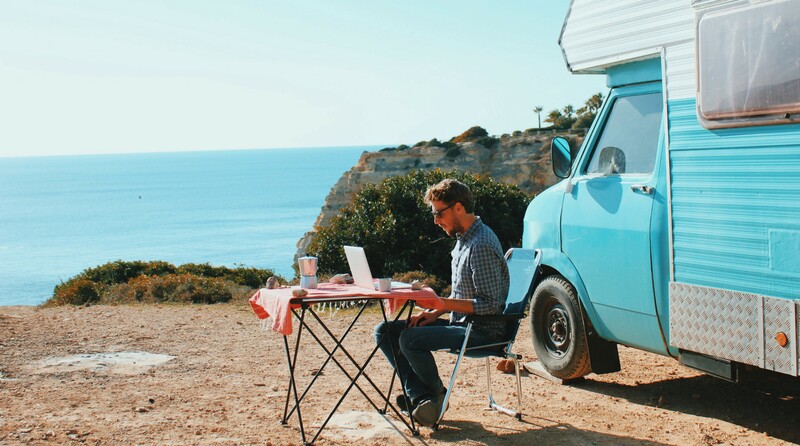 I had seen and read enough about digital nomads, vanlifers, wanderlust etc. to come to the conclusion that maybe I could be doing the same thing, right? So, I bought a campervan. Talking about it with my boss and colleagues (which I probably should have done before I bought the campervan) was easier than I initially thought it would be. They seemed enthusiastic about my plans. And I’m pretty sure they were not just getting rid of me. The main problem would be communication. Would I be able to have proper internet access? That’s pretty much all I need besides my macbook and caffeine. Turns out that my boss was willing to pay for a monthly data plan from Vodafone. They have (so far) great network coverage, which makes it possible for me to work in the most remote and beautiful places! Before this I was pretty much working from McDonalds and Burger King. I might have gained a few pounds. I truly enjoy the freedom of working when and where I want to. Now, with the added adventure of travel it’s even better. I do miss the getting together every week or so. Those Skype calls just don’t cut it. Besides that I work much fewer hours. Things didn’t really change. We still use Skype for group discussions and distracting each other from work. We were already actively using Trello to keep track of things. More direct communication such as iMessage, Whatsapp and good old phone calls have become less frequent. I think this is the result of me working less hours and slowly fading into the background. With less hours comes less responsibility. It’s impossible to stay up to date about everything that’s going on while working less hours and travel at the same time. It took me some time to accept this and adjust. Hot showers are a gift from God. Traveling and working does not equal vacation. This may seem obvious but the feeling of vacation often appears while traveling in foreign countries. Trying not to spend all my money on food, trips, museums and stuff was hard at first. Staying away of any form of civilization helps with this. I said goodby to structure. We were never close, so it’s OK. Planning my work hours seemed useless because I’m pretty much depended on the weather now. No sunbeams on my solar panel means no powering my macbook. Not working is easy, stop thinking about work is not. It’s hard to be in the moment when your mind keeps wondering of. I still struggle with this sometimes. Any tips? I’d love to hear them.